The 40th Newport (R.I.) International Boat Show saw an estimated 10 percent increase in attendance, according to show manager Nancy Piffard. "People overall were so much more positive and seemed more ready to buy and spend, compared to last year," Piffard said. "It was exciting to see, and hopefully this will continue for other boat shows into the future." The Newport show, which ran Sept. 16-19, started the fall show season in a big way, featuring new sailboats and powerboats from U.S. and international manufacturers. A big draw was the America&apos;s Cup 12 Metre Legends Reunion panel, held Sept. 16, that featured Gary Jobson, ESPN&apos;s yachting commentator and co-chairman of the reunion, as the moderator. "We probably had about 200 people at that event alone," Piffard said. "We were honored to have them as our guests for the show." Ben Wilde, president of Wilde Yacht Sales in Essex, Conn., said the dealership sold a Ranger 25 at the show. "It was the best Newport show we&apos;ve seen in the last five or six years," Wilde said. "The attendance was truly amazing on Friday and Saturday; both were very busy days for us." 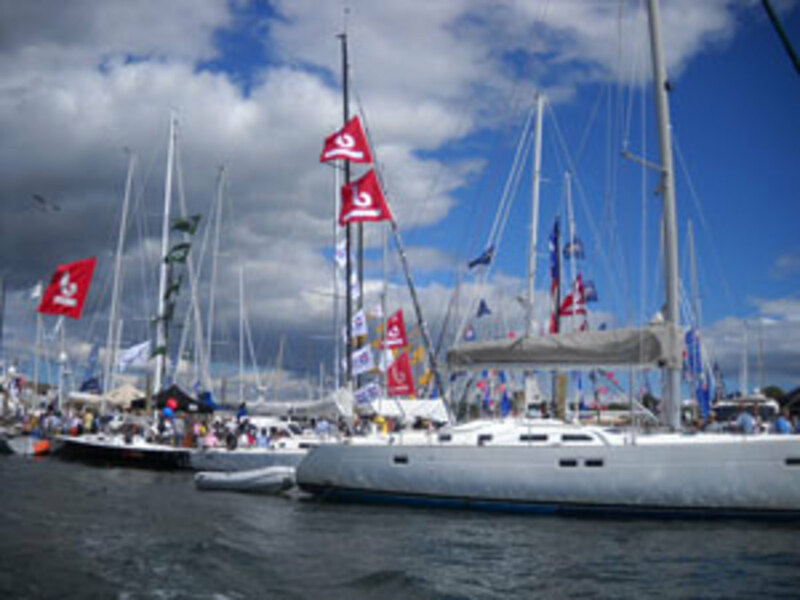 Wilde teamed with Winter Island Yacht Yard of Salem, Mass., which sold a Ranger 27 at the show. He said the yards, which displayed together, won for best overall display and best in-water display for powerboats. "It was a great experience working with Ben; we&apos;d definitely do it again," said Peter Haywood, CEO of Winter Island Yacht Yard. Bentley Collins, vice president of marketing and sales for Sabre and Back Cove Yachts, said the mood overall was extremely positive. "We sold a Back Cove 30, a Sabre Spirit and a Sabre 426," Collins said. "There was no negativity being expressed. ... People were not talking about themselves. They were talking boats." Jeff Johnstone, president of J Boats Inc., said there was a higher degree of interest and enthusiasm at the show this year. The company debuted the J/111, its newest model, and it drew a crowd. "We don&apos;t know yet how we did, but the vibe was good and there was a noticeable uptick in the number of knowledgeable sailors coming through," Johnstone said. "We never felt like we were wasting time. ... I think people are ready to reclaim their sailing lives again."